Home / Volley / Global Football / Are Warrior women’s woes a reflection of present TTFA leadership? 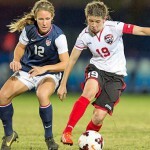 The Trinidad and Tobago national women’s football team represented the country’s best chance to qualify for a FIFA senior tournament since the men’s Germany 2006 World Cup. Today, it arguably represents something else entirely. Over the past 24 hours, the national women left for Houston in a fashion that is becoming too common for local representatives; one batch of players left on July 29; and the second on July 30. The women are over two weeks late for a pre-Caribbean Cup camp that was due to commence on July 10. And, during that period, they were prepared by a coach, Marlon Charles, that Trinidad and Tobago Football Association (TTFA) general secretary Sheldon Phillips sacked just over three weeks ago. 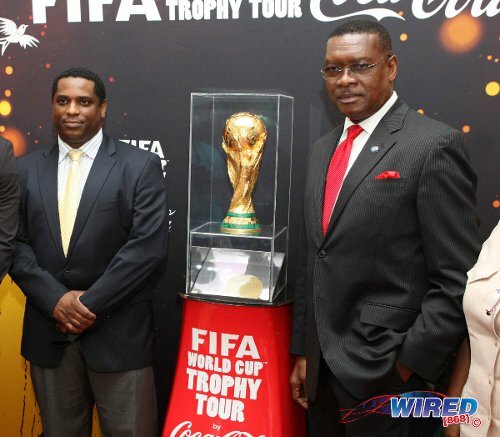 The 2014 Caribbean Cup kicks off on August 19 in Trinidad. Photo: Trinidad and Tobago women’s coach Marlon Charles (background) instructs his team during an international fixture against Chile in the Singapore 2010 Youth Olympic Games (YOG) at the Jalan Besar Stadium in Singapore, Aug 12, 2010. Charles, who worked without of salary or stipend for the past two years, voiced concern that the TTFA supposedly went behind his back to hire American Randy Waldrum as his boss and plot the preparation of the squad. Phillips’ response was to publicly humiliate Charles with the suggestion that even his players did not want him. 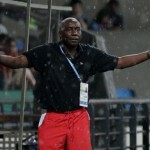 The TTFA’s subsequent failure to raise funds for the team’s trip to Houston in a timely fashion saw Charles, who was re-hired as assistant coach, again take charge as the women marked time before jetting off to prepare for a Trinidad tournament in Texas; so as to spare Waldrum the inconvenience of leaving his homeland for two months. Such treatment is not limited to the ladies or the coaches who Phillips does not fancy either. 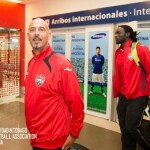 On June 21, the TTFA issued a release about an August camp for the “Soca Warriors” that caught head coach Stephen Hart by surprise since, despite his requests for one, he was unaware than any had been scheduled. Phillips’ release followed a Wired868 article which pointed out that the Warrior players and coaches were still owed per diems from their recent South America tour and match fees from a friendly international against Iran on 8 June. 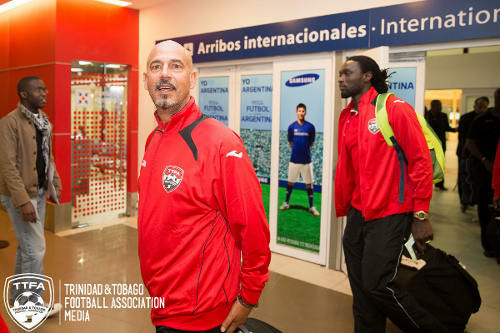 Photo: Trinidad and Tobago national football head coach Stephen Hart (centre) and captain Kenwyne Jones (right) land in Buenos Aires for a June friendly against Argentina. 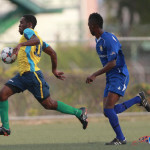 More than a month later, the men’s camp never materialised, the Warriors still have not been paid, the national youth teams are limping along without funding and the TTFA’s office staff has gone three months without pay. TTFA president Raymond Tim Kee, who is also the Port of Spain mayor and PNM treasurer, has not responded to calls from Wired868 or made any public pronouncement on the calamitous state of the local game. Phillips is more available to the media although some of his statements have, arguably, been bizarre. Last Friday, Phillips gave a list of the current TTFA leadership’s 50 accomplishments to Soca Warriors Online (SWO) site manager Inshan “Flex” Mohammed which included: the settlement of the 2006 World Cup bonus dispute, an improved relationship with government, GISL television rights deal, aversion of FIFA normalisation committee and his own hiring. In fact, the World Cup bonus dispute remains active, the TTFA’s relationship with Government has not translated into a budget for football while no figures were ever given for a GISL deal. The normalisation committee he referred to was initially proposed to FIFA by a group that included his father, Lincoln Phillips, Tim Kee and himself; but the notion evaporated when Tim Kee found another avenue to power. Does Phillips want credit for avoiding his own attempt to take over the local game? “Our official position is that the use of litigation as a vehicle to answer questions pertaining to the whereabouts of the alleged figures being cited is not a prudent strategy because of expense, time, questionable outcome, and ability to collect if successful. You can look no further than the 2006 players’ own experience in that they were engaged in litigation with the then TTFF for over 8 years with little to nothing to show until President Tim Kee voluntarily entered into discussions to settle the case upon his election to office. “Keeping in mind that the basis of the player case was a breach of contract claim. In matters involving alleged fraud or misappropriation of state funds, the burden of proof is substantially higher and would require an even greater commitment of time, money, and resources; all of which would be better placed towards developing football. “In our view, utilizing government agencies to raise questions specifically pertaining to the use of state funds is the more prudent path to take. We have met with President (Anthony) Carmona to discuss the matter and are reviewing several options. “Soon after our meeting with His Excellency, President Tim Kee made himself available for an interview with the Integrity Commission whose interest in the handling of state funds has been piqued by our inquiry. However, there is one thing we won’t indulge and that is the joining of what I call the pitchfork and torches brigade. “The pursuit of the basic question; ‘Where and how was the state money received between 2004-2006 spent?’ must be done in an unemotional and detached manner where inquiries and actions are based on the availability of authenticated evidence. Phillips long-winded response either ignores or makes a mockery of the TTFA’s High Court depositions that all 2006 World Cup revenue was banked or re-routed to the accounts of its former special advisor, Jack Warner. And he failed to mention that Tim Kee failed to act on offers from the 2006 World Cup players to help in the recovery of the missing millions. More to the point, the questionable list of successes could not have gone down well with the players, coaches and administrators who are struggling through this nightmarish period. Tim Kee promised to steer football clear of its financial woes and public distrust. Instead, debts climbed while coaches like Anton Corneal, Leonson Lewis and Jamaal Shabazz resigned, Dutchman Leo Beenhakker rescinded his vow to accept a post and there was public outrage over the TTFA’s horribly mismanaged fund-raiser for since deceased World Cup youth footballer, Akeem Adams. Phillips’ recent self-imposed deadline for the appointment of a new TTFA technical director came and went on 15 July 2014; local football has operated without a TD for four months now. The mantra of Tim Kee and Phillips is that local football is saddled with debts from the incompetent past regime but is now pushing into the glorious sunlight through their inspired leadership. The reality is the current TTFA leadership has actually proven to be less resourceful and transparent than its immediate predecessors. 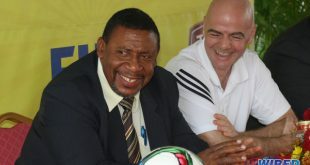 Former TTFF president Lennox Watson and general secretary Richard Groden, through Anthony Harford’s All Sport Promotions, managed to raise the funds to keep the “Warriors” on course to the 2013 CONCACAF Gold Cup, despite being openly at loggerheads with Sport Minister Anil Roberts and then Minister of Works, Warner. Harford sent income and expenditure balance sheets to the media within a week of every national game during his two-year stint with the TTFA. In two years, Tim Kee and Phillips have not revealed the income and expenditure for any of the seven exhibition matches during their tenure; even though Phillips brazenly listed football matches first among revenue streams available to the TTFA. Even the 2013 OSN Cup in Saudi Arabia, which carried a cash prize, was not followed by a TTFA press release or internal statement to suggest what the Warriors earned financially for its appearance in Riyadh. Photo: Trinidad and Tobago defender Seon Power (second from left) and midfielder Keyon Edwards (far left) join the celebrations as the “Soca Warriors” book their Gold Cup place during the 2012 Caribbean Cup final in Antigua. Typical of Phillips, he listed the country’s qualification for the 2013 Gold Cup as an accomplishment for the present executive although the Gold Cup campaign waged for three months under Watson and for 11 days under Tim Kee. And the TTFA’s talk of splitting from the Warner-led administration sounds hollower than ever these days. 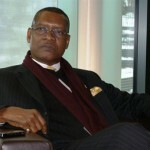 Not just because Tim Kee spent nearly two decades as vice-president under the disgraced former FIFA vice-president and refuses to call him to account for hundreds of millions in missing revenue; but because the TTFA just promoted Warner’s most loyal servant left in local football, Eastern Football Association (EFA) general secretary Neville Ferguson, to run the Super League competition, which is the highest level of domestic football under its watch. Most recently, the shambolic preparation of the senior women’s team raises more questions about the capability of the TTFA’s chiefs. Last September, Charles led the under-17 women’s team to the Caribbean title, which, of course, was listed among Phillips’ accomplishments. But, with a senior World Cup spot within striking distance, Phillips decided to get more involved in the women’s programme. Unsurprisingly, Phillips also listed Waldrum’s hiring as an accomplishment although the coach is yet to face a competitive fixture with the team. Most of the women wore Adidas jackets for their departure as there was not enough Joma gear to go around. The Joma deal, of course, is another TTFA accomplishment. The general secretary would surely like to retain his post long enough to see if his national women’s team gamble pays off. Whether local football can afford another year of Phillips and Tim Kee is another matter entirely. Editor’s Note: Click HERE to read Sheldon Phillips’ 50 self-proclaimed accomplishments. Next The Black Butterflies: Still A Prisoner? He ought to know well. I’d be curious to hear Mr Panday’s answer. Perhaps, Basdeo Panday, you can give us an insight into how people are recruited into politics in Trinidad and Tobago. And what causes them to lose their way… Or is it that the wrong sort are recruited to begin with. Mr. Panday I don’t know how you manage to maintain your decorum, but I for one am at my wit’s end. I’m not quite convinced though that a new political system will serve us any better than the current one in uses, it could be the design of the political, it could be the material it is comprised of or worse, it could be both. What I do know however is that we’re in deep…………real deep! Vernal, It will take a leader like Lee Quan Yew. Or a new political system. I don’t know what it would take to get this nation to adopt accountability as a virtue. But i know as it stands now nepotism is in the way. I didn’t read the whole thing but this has been happening for years. How on earth these guys still in charge? No accountability! Lack of proper sports administration, this is certainly a slap to the face for these girls after they accomplished so much smh!!! I would like to give an objective as possible view on this. Mr. Phillips has a plan that Some can shoot holes through and others can apply mortar to. It is unlikely that the old machinery which is put in place today will effect such a plan. Taking on the added responsibility of running the Super League and trying to reconcile the schools football to the FA at this time suggests that Mr. Phillip has a big back office or has a large enough S on his chest. What we see on the pitch will be a reflection of such leadership. I would expect more woes in the near future also for the mere fact that Sheldon Phillips has not announced who he has trained to execute the deliverables of this very intricate and delicate strategy. Delicate because one bad move would cause major setbacks. Harford tried to give account of monies and Phillips is doing so with milestones. It would be interesting to see if he will pay the same price as well. The more Sheldon Phillips reveals his philosophy, the more he sounds like a sophisticated Anil Roberts. I can think of several four-letter words that might, used together, sum up my feelings about the performance of Messrs Phillips and Tim Kee and the state of national football. But for today let’s just settle for one eight-letter adjective: PATHETIC! I always enjoy your articles, but I am truly depressed by the current state of affairs in T&T football. I am beginning to think that it might be worthwhile for the government to intervene in the affairs of the TTFA regardless of any FIFA ban that results. What do you think? Nope, no government intervention. FIFA can ban TT. If by next year the current admin can’t get the TTFA out of debt, then find other people who can. If we don’t realise by now that this is not Carib Counry but BS country, I don’t know when we will. It continues. The smoke and mirror distraction that is the approach of administrations in Trinidad and Tobago. Sport is but one of the victims of financial improprieties and seemingly deliberate mismanagement. We have clearly run out of leadership options. I am at a loss as where to turn. So the reason they won’t pursue the matter is because the Soca Warriors weren’t successful in getting what was owed to them because the TTFA refused to pursue the funds that they cannot account for? Where do they find these idiots who insist on insulting the public intelligence? I am convinced that they have been specially trained to speak this type of nonsense. That Tim Kee is the Treasurer of the PNM is the main reason I cannot believe they have learned their lessons from the last election. I am still baffled how he explains his unwillingness to pursue the lost funds to his political overlords. It makes no sense to me at all. Just remember….Tim Kee is the PNM treasurer eh. I say no more.